London’s Innversions Festival runs from 3 to 14 July across London. The line-up for Innversions Festival 2018. Today the second annual Innversions Festival kicks off in London. The festival, put together by promoters AGMP, runs from 3 to 14 July 2018 and brings together some of the finest artists across soul, jazz, funk, hip-hop and R&B. Various venues across the capital will host shows, including the Roundhouse, the Barbican, Koko, and Under The Bridge. 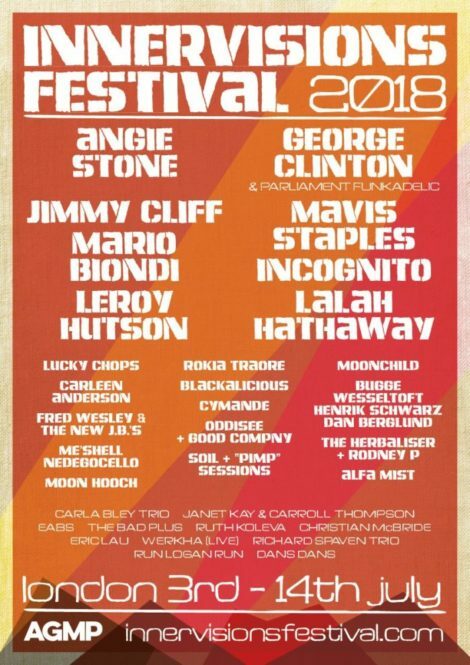 The festival sees some of the all-time greats perform, including Mavis Staples, Fred Wesley & The New JB’s, Jimmy Cliff, Lalah Hathaway and the last ever London performance by George Clinton, who is set to retire from Parliament-Funkadelic next year.